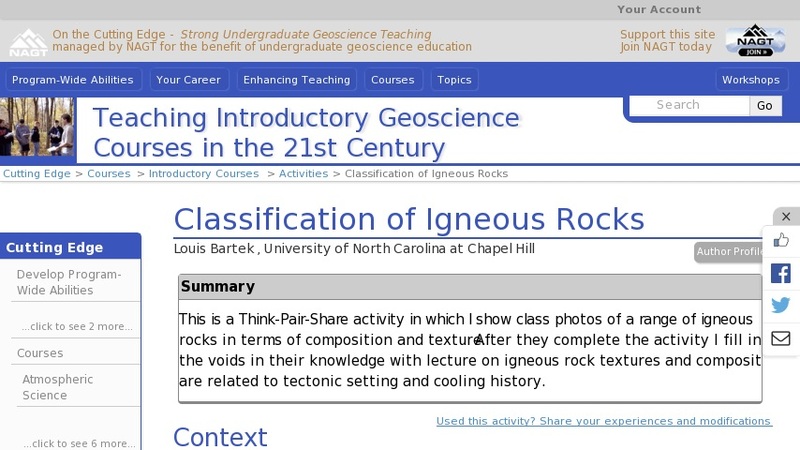 This is a Think-Pair-Share activity in which I show class photos of a range of igneous rocks in terms of composition and texture. I ask them to individually examine the texture and color of the rocks and decide how they might come up with a classification for the rocks. I also ask them to develop hypotheses about how the composition of the rocks may be related to tectonic settings and how the textures may be related to cooling history. After they do this individually I then have them partner with another student and they discuss their ideas. I then call upon different groups of students to address components of the topic. After they complete the activity I fill in the voids in their knowledge with lecture on igneous rock textures and composition are related to tectonic setting and cooling history.